Keto Bacon Bomb with Keto Barbecue Sauce - Headbanger's Kitchen - Keto All The Way! Now that we’ve gotten our Keto BBQ sauce sorted out, I thought it was time to celebrate having 100,000 subscribers and I thought redoing my recipe for the Bacon Bomb seemed fitting. For those who don’t know, the bacon bomb was my signature dish when I started HK. Well seasoned pork mince, stuffed with cheese, peppers, onions and bacon and wrapped in bacon, covered in BBQ sauce and baked. That is the bacon bomb. I used to use store bought BBQ sauce for the recipe back in the day which was the main non Keto ingredient. For this video I thought I would also change up the fillings a bit and I used green peppers, lemon zest, onions, cheese and some beef pastrami. 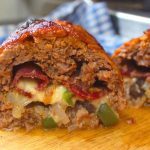 The bacon bomb is really simply put, a great meatloaf recipe. Stuffing it with cheese and veggies keeps it quite moist, as does wrapping it in bacon. What I love is the way the BBQ sauce gets all sticky and forms a crust over the bacon. When it comes to fillings apart from the basic meat and cheese you can also stuff it with jalapenos and olives. You can be quite fancy with the cheese as well using everything from goats cheese to blue cheese. I personally use pork as it’s got a good fat % but you can also use beef or chicken for the meatloaf itself. It’s the perfect dish for a nice gather of family or friends. It’s always been a talking piece at my dinner table and a much requested one by my guests. This recipe makes 5 serving. Get this recipe on myfitnesspal. 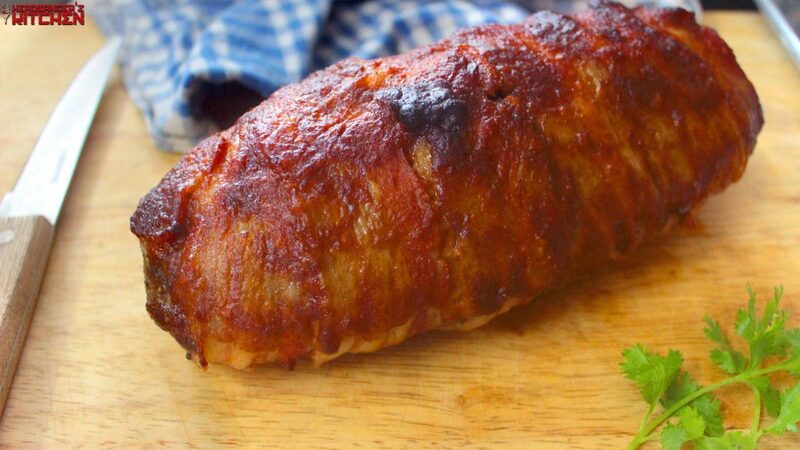 A stuffed pork meatloaf that's wrapped in bacon, covered in BBQ sauce and baked. Season the pork with salt, pepper, paprika, cayenne pepper and garlic bread seasoning. On a cutting board lay down some cling film and spread the pork mixture to form a square. Allow the bacon bomb to rest for 15-20 minutes after cooking and then cut and serve. We love this recipe! We included it in our top 26 Keto recipes article- https://bit.ly/2wKpsmV Thanks again! I buy bacon and I keep saving the fat. Over time I’ve collected a lot.